In the summer of 2018 Play N Go released the Sizzling Spins video slot. It captures everything fun about the warmer months of the year. The good news is that thanks to this game, the excitement of summer can last well past August. The barbeque/cookout theme of Sizzling Spins is so strong that the reels resemble an outdoor grill. The sound effects are so realistic that players’ mouths will likely start watering when they hear them. This is just the tip of the iceberg in what this game offers. The reels are filled with symbols of foods cooked on a grill. The highest value symbol is the ribs. Others include prawns, sausages and chicken wings. A chili pepper serves as the game’s scatter symbol. There is also a foil blocker symbol that can help or hurt players. Every time the reels are spun, the first, third or fifth become inflamed. In this form, it is a hot reel, which is where players want the foil blocker. This makes the reel’s symbols wilds. Players then get a free re-spin of the reels. The hot reel stays in place until the spin is completed. Reels can be re-spun for free until no wilds appear or shot reel appears. The maximum number of re-spins at one time is four. When the fourth re-spin produces a wild, players’ winnings are doubled. The standard free spins are triggered with three chilli peppers. Players then click on one pepper, which sets the number of free spins. These free spins are played using four rows of symbols. If a foil blocker lands on the reels, they become wilds. This is true even if they aren’t on a hot reel. During free spins, re-spins are always possible. In addition, chilli pepper symbols bring multipliers. Winnings are doubled with three chilli peppers. Six chilli peppers triple their winnings. With nine chilli peppers, players win five times the amount of their bet on that spin. On a warm summer’s night, Sizzling Spins is the perfect online slot machine. Its graphics and sound effects attract players who long to barbecue again. The appeal of this game is likely to last all year long. 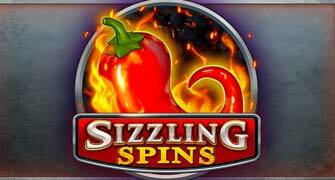 Not a typical online slot, Sizzling Spins is a great way to stay entertained. For those who love to barbecue, it’s an instant hit. The bonus features make it a game anyone can get excited about. With the added incentive of the foil blocker, players have a new twist to enjoy. Few games are as creatively designed as this one. Its interesting features make it compelling even to new players. 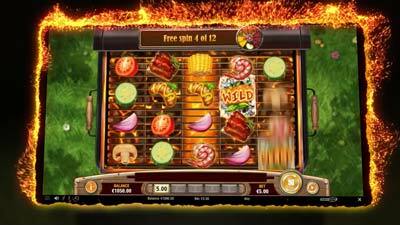 Bonuses other games don’t have mean Sizzling Spins is a unique gaming experience. Having a universal theme, it is a game player can relate to. Play N Go has done a lot to capture the spirit of summer. For players around the world, this game is a real treat they can always enjoy.